My kitchen clumsiness apparently knows no bounds. After burning my breakfast this morning I decided to make some that’s unscrewupable, a classic carrot cake with cream cheese frosting. I made the cake, did a pretty good job of slicing it in half, iced it, then placed it on a pretty cake stand. 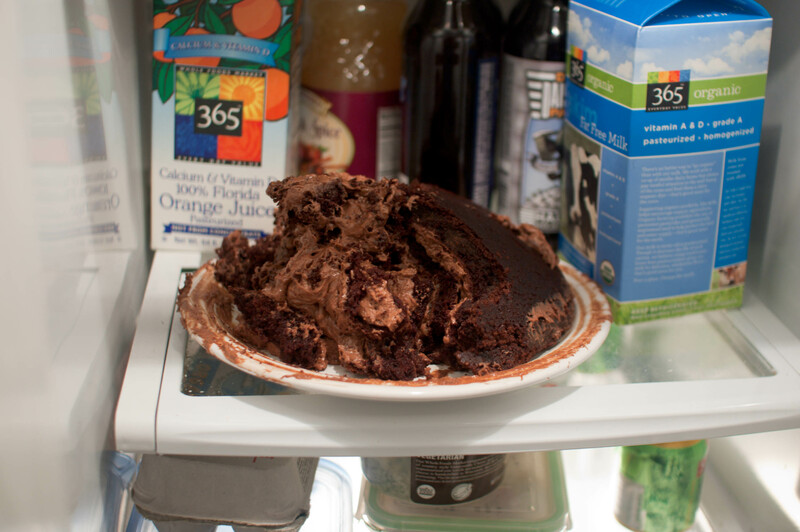 I started to carry it over to my tabletop to photograph when “SPLAT!” the cake slid right off the stand and onto the kitchen floor. Looking down on the cake the first thing that came to my mind was this episode of Friends, so I thought I’d share some clips of the episode with you. I figure its better to laugh over lost cake than cry, right? I was able to save the top half of the cake, and I can tell you it’s really good. If you’re interested in making it the recipe is here. Well at least you got half of it!! Yay for bright sides! I have seen that episode of friends! I keep my ktichen floor very clean so I totally would have still eaten the cake ;)! I’m sorry to hear about your cake. The recipe looks great! “Theres a piece without floor on it!” *SIgh* I miss Friends. I just had one of those day last week when I managed to spill half a bag of arrowroot all over my counter spill milk on the floor and completely obliterate the top crust to my pie when I tried to all in about 30 minutes. I think that was a sign it was time to get out of the kitchen! Oh no!! That’s terrible! I’m sure it wasn’t funny at the time but picturing it it’s playing out exactly like the friends episode. The recipe sounds delicious, at least you got to enjoy some of it! Oh no!! I did that once when I was unpinning a marble cake. I somehow missed the plate and it plopped right out of the pan, bouncing of the counter and splattering into a million pieces on my floor. Always a sad/annoying experience but you’re right to have a laugh about it! That’s all we can do, right? Ahh, Floor Cake. I whole heartily believe that a cake falling to the ground adds something special you just can’t recreate any other way! Two years ago was my first attempt at making decorated cakes in a good 10+ years. It was for a family members first birthday. I baked two 1/2 sheets, let them cool, went to go wrap the first one, lost control and dropped the entire thing off the counter. I was back at the store at midnight buying more supplies. Stayed up until 3 am baking another cake, headed to bed and fell down a flight of stairs. I can tell you that the salvaged floor cake I scooped up for myself was fabulous.